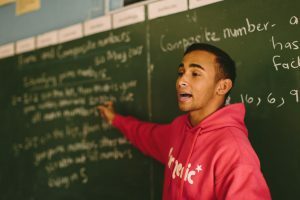 Our mission is to help young South Africans excel in mathematics and to train well-equipped and passionate teachers for the public school system. Excellence – We focus on quality in everything that we do. We recruit passionate people, deliver excellent teaching and training, and make a lasting impact. Integrity – We do what we say we’re going to do. We are deeply and genuinely committed to our purpose and we do the right thing even when no one is looking. Community – We value people. We build community within our team, amongst our coaches, and within the communities we serve. It is community that gives us a collective sense of purpose, and the resolve to overcome great challenges. Trust – We provide autonomy for team members to accomplish the tasks expected of them and trust them to use creativity to achieve our goals. Learning – We are constantly learning and seek to use our learning to improve ourselves and our programs. We deeply value and respect diverse perspectives and rely on open dialogue and honest feedback to improve.